Our company Bora Fly allows you to book a private flight on demand, in any city of Madagascar. 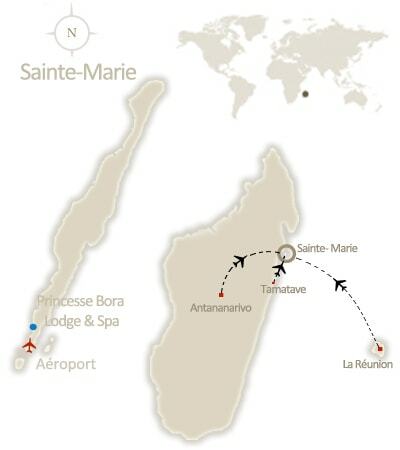 The airport of Sainte-Marie Island (Ravoraha) is situated two minutes by car from Princesse Bora Lodge and Spa. It is regularly served from the capital Antananarivo (one hour flight) by two airline companies: Air Madagascar and Madagasikara Airways. Some days, flights can departure from Toamasina or Reunion Island. Our partner Bora Fly can also help you for a private plane booking.